We were introduced to Church History in October, when we looked at the early Church, from the Apostles to Constantine, the early development of Christian doctrine and the first Councils of the Church. This afternoon, I would like us to look at the origins of Christianity in Ireland, including the arrival of Saint Patrick on this island and the development of the “Celtic Church” – if there ever was such a body – and how this has contributed to the current identity of the Church Ireland. The Preamble and Declaration adopted by the General Convention of the Church of Ireland in 1870, described this Church as “the Ancient Catholic and Apostolic Church of Ireland,” … holding to that faith “professed by the Primitive Church” (see The Book of Common Prayer (2004), p. 776). But what does it mean to be the Ancient Catholic and Apostolic Church of Ireland”? What claims are being made here? What claims to identity are being made? And if some things are being included in our identity, what is being excluded? The only place the word “Protestant” is used in The Book of Common Prayer (2004) is on the same page, where it is said: “3. The Church of Ireland, as a Protestant and Reformed Church … doth hereby …” (p. 775). On the other hand, the word Catholic is used throughout all editions of The Book of Common Prayer, and not just in the Creeds (see pp 12, &c). The Collects of Saint Patrick’s Day describe Saint Patrick as “the apostle of the Irish people” (p. 305), and the Irish figures saints listed in the Calendar (pp 18-23) are all figures in what might be called the “Celtic Church” (Saint Patrick, Saint Brigid and Saint Columba, pp 20 and 22, and 38 others on pp 22-23) with three exceptions: Richard FitzRalph (27 June, 1360), Jeremy Taylor (13 August, 1667) and Charles Inglis (16 August, 1816). 2, The Church of Ireland sees its identity in terms of continuity with “Celtic Christianity” in Ireland, especially the great monastic sites, and in particular with those monastic sites that have given their names to our dioceses. Has history shaped our identity? Or has our identity shaped our understanding of the history of Christianity? 1, Did Christianity arrive in Ireland with Saint Patrick? 2, Who was Saint Patrick? 3, Was there a distinctive Celtic Christianity? 4, Did other identities also shape the identity of the Church of Ireland? 5, And is so, how do we name or claim and integrate those identities? Did Christianity arrive in Ireland with Saint Patrick? But there were Christians in Ireland before Saint Patrick’s arrival and his work as a missionary is only part of the story of the origins and growth of Christianity on this island. A hint of this is already found in the way Irish mythology was long anxious to claim Irish connections with the Christian story that predate Patrick date back to Biblical times. By the end of the third century, people from Ireland were establishing colonies on the neighbouring island, with colonies in north-west and south-west Wales, in Cornwall and on the west coast of Scotland. By the third or fourth century, there was regular commercial, mercantile and social contact between communities in Ireland and Roman communities in Britain and Gaul. So, for example, there have been abundant finds of looted Roman coins all along the northern and eastern coasts of Ireland: at the Giant’s Causeway (1831), Coleraine (1854) and more recently at Limavaddy; and Roman silver ingots with similar Christian provenance have been found in Kent and Limerick. Christianity probably arrived in Ireland in the 4th and early 5th centuries by a slow and gradual process of unplanned infiltration, from Britain and from Continental European, probably from Gaul and what we now know as Germany, and perhaps even from the Iberian peninsula (Spain and Portugal). There is some evidence that suggests the gradual conversion of Ireland by Britons in the 4th century and possibly early fifth century. There are traditions that some Irish saints preceded Saint Patrick in date: Ciaran of Seirkieran (Diocese of Ossory); Declan of Ardmore, Co Waterford; Ibar of Begerin, Co Wexford; Ailbe of Emly, Co Tipperary; Meltioc of Kinsale, Co Cork; and so on. Most of these are associated with the south and the south-east, although there is no primary evidence to support these largely unreliable traditions. Nevertheless, the presence of British Christians in Ireland must have had an influence, direct or indirect, on the spread of Christianity in Ireland before 431, and by the time he began his mission Patrick would have found the British Christians resident in Ireland forming the nucleus for his mission and his Church. Germanus of Auxerre was sent from Rome to Britain in 429 to combat the impact of Pelagius and Pelagianism on the Church in Roman Britain. Soon after – perhaps in 431 – Palladius was ordained by Pope Celestine, and he was sent as the “first bishop” on a mission to “the Scotti [Irish] who believe in Christ.” So, we know that from at least the third decade of the 5th century, the Irish Christians were numerically large enough to have a bishop sent from Rome, and Palladius is associated with a number of church sites in Leinster. The late Professor Patrick Corish, in The Irish Catholic Experience (1985), links the mission of Palladius in Leinster with, perhaps, three churches in Co Wicklow. 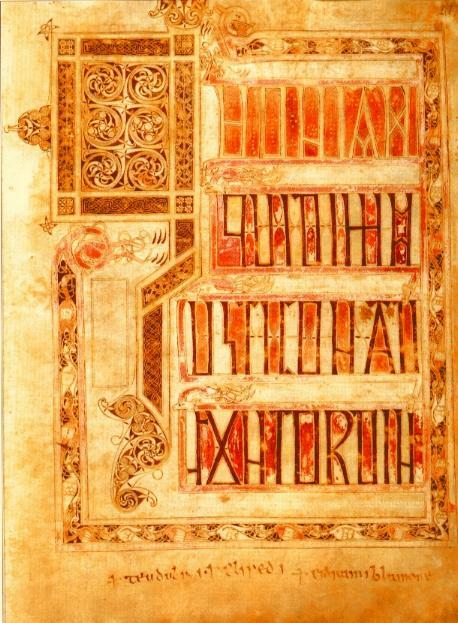 The circular letter known as The First Synod of Saint Patrick seems to provide evidence of a second-generation missionary Church in Leinster, and this stream of Christianity in Ireland has been associated with the Church in Kildare. The young Patrick was captured in a great raid in which “many thousands of people” [Confessio 1], some of whom were lukewarm Christians, according to his own account, and some of them could also have been committed Christians, perhaps even priests. In his Confessio , Patrick shows he is aware of episcopal activity in other parts of Ireland, including baptisms, confirmations and ordinations. Patrick says he travelled to places in Ireland “where no one else had ever penetrated, in order to baptise, or to ordain clergy, or to confirm the people” – suggesting there were places that had received episcopal ministry from other, earlier sources. So, Christianity had already taken root in the island before Saint Patrick began his mission. Believing he was called by God to a mission to the Irish, he entered the monastery of Saint Martin of Tours. He was subsequently ordained a bishop in Rome, and was sent to Ireland by Pope Celestine, who died in 432. It is said that Saint Patrick built 365 churches and consecrated an equal number of bishops, established schools and convents, and held synods. The sites associated with him include Armagh, which became the centre of the cult of Saint Patrick, Croagh Patrick in Co Mayo and Lough Derg on the borders of Co Donegal, where he is said to have spent time in retreat, and Downpatrick, where he is said to have been buried. There is no historical reason to associate Saint Patrick with the site of Saint Patrick’s Cathedral in Dublin, or the supposed Saint Patrick’s Well at the Nassau Street side of Trinity College Dublin, or other sites such as Holmpatrick in Skerries or Saint Patrick’s Church in Donabate, both in Fingal in north Co Dublin. Neither the canons attributed to him nor the Breastplate of Saint Patrick is not his work. Later seventh-century documents speak of Patrick as the successor of Palladius. However, the O Neill dynasty had Tireachan and Muirchu write spurious accounts of Patrick’s life to establish Armagh’s claims to primacy in Ireland. Is there such a thing as ‘Celtic Christianity’ or a ‘Celtic Church’? Was there a distinctive Celtic Christianity? The monastic system In Ireland became increasingly secularised from the 8th century on, with the monasteries even making war on each other or taking part in secular wars. For example, 200 monks from Durrow Abbey are said to have been killed when they were defeated by the monks of Clonmacnoise in 764. Columba is associated with the foundation of abbeys at both Kells, Co Meath, and Durrow, Co Laois. However, was held partly responsible for the Battle of Cúl Drebene (561) and was sent into exile. In 563, he founded the monastery of Iona which became one of the major centres of Irish missionary activity in Scotland and northern England. However, the observance of Irish customs led to the expulsion of Columbanus and his companions from Gaul in 610, and they eventually settled in Bobbio in what is today northern Italy. He died in 615. His surviving works include letters, sermons, a penitential and rules for monastic and community life. Saint Gall was a disciple of Saint Columbanus, and followed him to Italy in 612. However, Gall remained in what is now Switzerland, where he lived the life of a hermit until his death around 650. The monastery of St Gallen, which takes its name from him, was founded ca 719 on the site of his hermitage. In 1028, King Sitric the Silkenbeard of Dublin made a pilgrimage to Rome, and Christ Church Cathedral was founded soon afterwards, and certainly before he was deposed in 1036. The first Bishop of Dublin, Dúnán, was appointed in 1030, and the bishops of the Norse cities initially looked to Canterbury in their loyalty. So, when we talk about the Church of Ireland “the Ancient Catholic and Apostolic Church of Ireland,” … holding to that faith “professed by the Primitive Church,” there is more to that than Saint Patrick, or the Celtic monasteries. 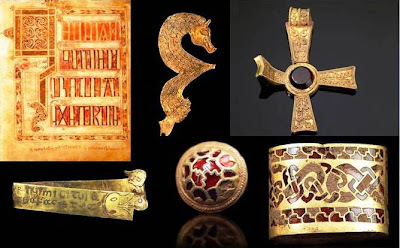 Christianity in Ireland predates saint Patrick, whoever he may have been, and primitive Christianity in Ireland owes much not only to the Celts, but to Romans, Vikings, Norman, and many others. And if so, how do we name or claim and integrate those identities? The fifth question I asked was whether we can name or claim and integrate those other identities? What about not just the Celts, Romans, Vikings, Normans, but also those who arrived later from England, Wales and Scotland, the French Huguenots, the later refugees, immigrants and asylum seekers? Next: 6 June 2015, The Mediaeval Church and the Reformation. (Revd Canon Professor) Patrick Comerford is Lecturer in Anglicanism, Liturgy and Church History, the Church of Ireland Theological Institute. This essay is based on notes prepared for a lecture during the Reader Day Conference on Saturday 7 February 2015.